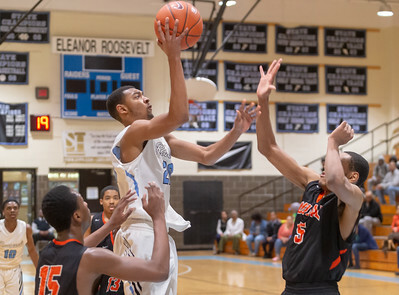 Boys HS Basketball: DuVal vs. Eleanor Roosevelt. 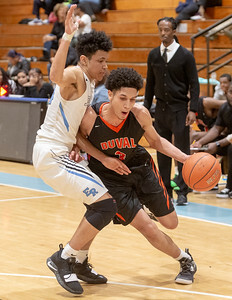 The Eleanor Roosevelt High School boys basketball earn their third consecutive blowout victory of at least 20 points as they defeated DuVal High School 71-44 on Feb. 7. 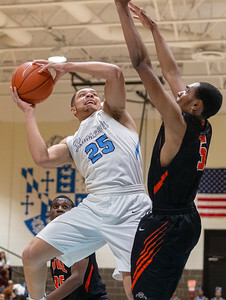 Photo by Michael Smith/The Prince George's Sentinel. 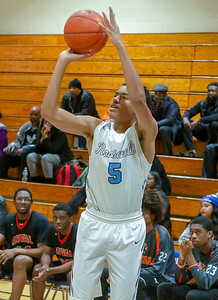 Greenbelt, MD, Thursday, February 7, 2019: Eleanor Roosevelt Jaamir Butler (5) takes a shot during a Prince George's 4A Boy's basketball game between Eleanor Roosevelt and DuVal held at Eleanor Roosevelt High School in Greenbelt, MD. Roosevelt won the contest 71-44. (Michael R. Smith/The Prince George's Sentinel). 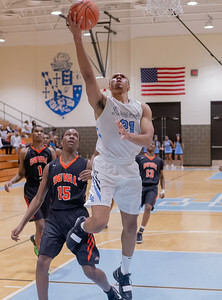 Greenbelt, MD, Thursday, February 7, 2019: Eleanor Roosevelt Jahmal Cochran (21) scores on a layup during a Prince George's 4A Boy's basketball game between Eleanor Roosevelt and DuVal held at Eleanor Roosevelt High School in Greenbelt, MD. (Michael R. Smith/The Prince George's Sentinel). 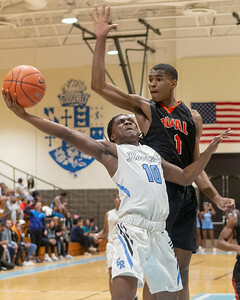 Greenbelt, MD, Thursday, February 7, 2019: DuVal Ishmael Smith (1) looks to block a shot attempt by Eleanor Roosevelt Olumide Lewis (10) during a Prince George's 4A Boy's basketball game between Eleanor Roosevelt and DuVal held at Eleanor Roosevelt High School in Greenbelt, MD. (Michael R. Smith/The Prince George's Sentinel). 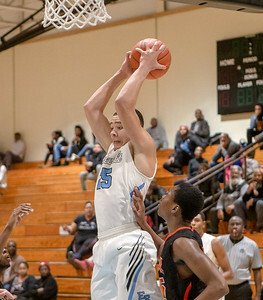 Greenbelt, MD, Thursday, February 7, 2019: Eleanor Roosevelt Isaiah Gross (25) grabs an offensive rebound during a Prince George's 4A Boy's basketball game between Eleanor Roosevelt and DuVal held at Eleanor Roosevelt High School in Greenbelt, MD. (Michael R. Smith/The Prince George's Sentinel). 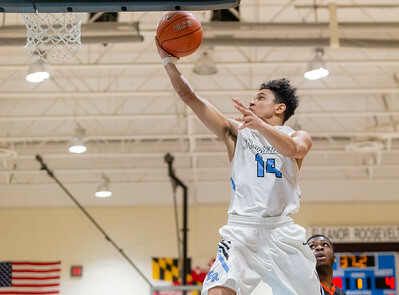 Greenbelt, MD, Thursday, February 7, 2019: Eleanor Roosevelt Jahari Simon (14) glides in for a layup during a Prince George's 4A Boy's basketball game between Eleanor Roosevelt and DuVal held at Eleanor Roosevelt High School in Greenbelt, MD. (Michael R. Smith/The Prince George's Sentinel). 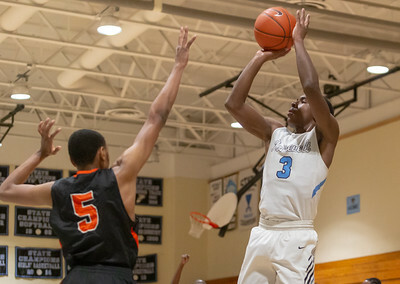 Greenbelt, MD, Thursday, February 7, 2019: Eleanor Roosevelt Cameron Brown (3) shoots over the out-stretched of DuVal Brandon Emanuel (5) during a Prince George's 4A Boy's basketball game between Eleanor Roosevelt and DuVal held at Eleanor Roosevelt High School in Greenbelt, MD. (Michael R. Smith/The Prince George's Sentinel). Greenbelt, MD, Thursday, February 7, 2019: Eleanor Roosevelt Isaiah Gross (25) and DuVal William Freeman (35) battle for a rebound during a Prince George's 4A Boy's basketball game between Eleanor Roosevelt and DuVal held at Eleanor Roosevelt High School in Greenbelt, MD. (Michael R. Smith/The Prince George's Sentinel). 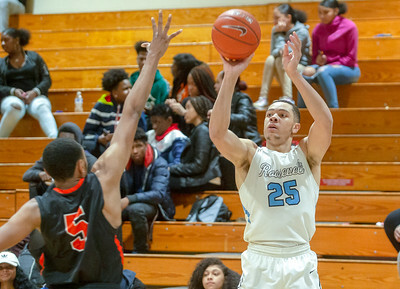 Greenbelt, MD, Thursday, February 7, 2019: Eleanor Roosevelt's Isaiah Gross (25) powers up a over Brandon Emanuel (5) of DuVal during a Prince George's 4A Boy's basketball game between Eleanor Roosevelt and DuVal held at Eleanor Roosevelt High School in Greenbelt, MD. (Michael R. Smith/The Prince George's Sentinel). 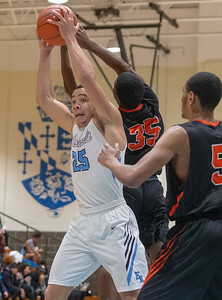 Greenbelt, MD, Thursday, February 7, 2019: Eleanor Roosevelt Isaiah Gross (25) takes a shot over DuVal Brandon Emanuel (5) during a Prince George's 4A Boy's basketball game between Eleanor Roosevelt and DuVal held at Eleanor Roosevelt High School in Greenbelt, MD. (Michael R. Smith/The Prince George's Sentinel). Greenbelt, MD, Thursday, February 7, 2019: Eleanor Roosevelt Cameron Brown (3) glides to the basket during a Prince George's 4A Boy's basketball game between Eleanor Roosevelt and DuVal held at Eleanor Roosevelt High School in Greenbelt, MD. (Michael R. Smith/The Prince George's Sentinel). 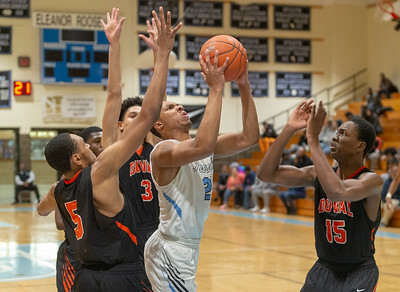 Greenbelt, MD, Thursday, February 7, 2019: Eleanor Roosevelt Jahmal Cochran (21) puts up a shot while surrounded by multiple DuVal defenders during a Prince George's 4A Boy's basketball game between Eleanor Roosevelt and DuVal held at Eleanor Roosevelt High School in Greenbelt, MD. (Michael R. Smith/The Prince George's Sentinel). Greenbelt, MD, Thursday, February 7, 2019: Eleanor Roosevelt Thomas Whitley (22) puts up a shot during a Prince George's 4A Boy's basketball game between Eleanor Roosevelt and DuVal held at Eleanor Roosevelt High School in Greenbelt, MD. (Michael R. Smith/The Prince George's Sentinel). 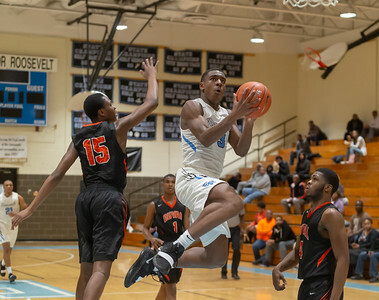 Greenbelt, MD, Thursday, February 7, 2019: DuVal Muhammed Yilmaz (3) drives around Jahari Simon (14) of Roosevelt during a Prince George's 4A Boy's basketball game between Eleanor Roosevelt and DuVal held at Eleanor Roosevelt High School in Greenbelt, MD. (Michael R. Smith/The Prince George's Sentinel).